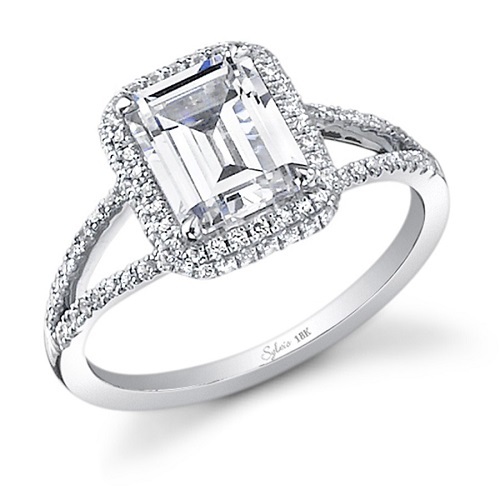 Emerald cut engagement rings offer a timeless elegance that will never date. This cut has an oblong shape that is not too long, and not too narrow. 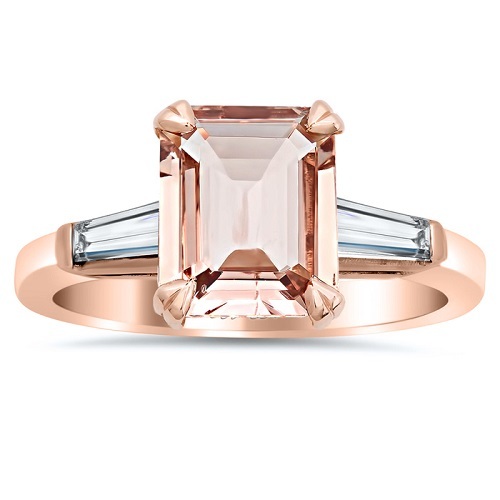 Taking its name from the stone most frequently cut in this shape, the emerald cut has a total of 58 facets. 25 are found on the Pavilion, 25 are found on the Crown, and eight lie on the Girdle, featuring three rows of top steps, and three rows of bottom steps. For brides-to-be who have a classic style, or those who favour stones that have plenty of sparkle, this cut suits almost everyone. 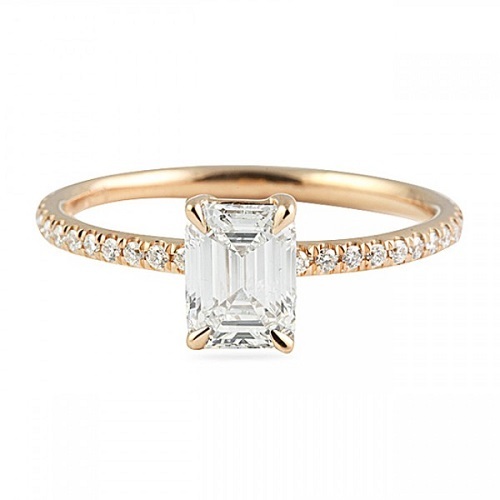 Wondering whether emerald cut engagement rings are the right choice for you? Thinking about offering your love this style of ring? We have selected a few magical ideas to show you what this ring has to offer. With its delicately twisting band, this ring can be incredibly versatile, depending on the stones and metal you choose. 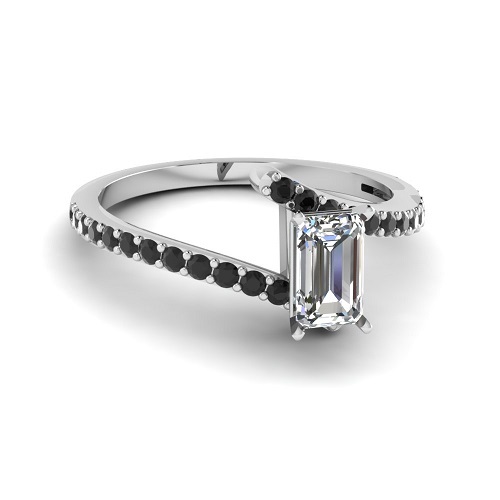 You could opt for a full diamond engagement ring, with tiny pave stones along the band and a centre emerald cut stone. Or, you could keep the band plain, and add impact with a metal such as rose or yellow gold. What makes this style work is the way that the twisted band adds visual interest without being too over the top or overwhelming. Baguettes work very well when placed alongside emerald cut stones. 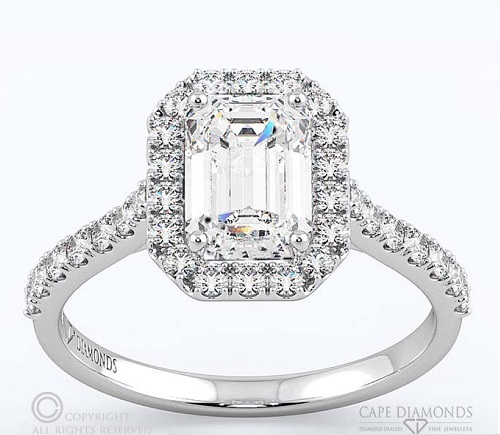 With a shape that is longer and thinner than the classic emerald cut, this shape of stone adds impact to the rectangular cut of the centre stone. The longer lines of this cut balance out the emerald cut without being too large or obtrusive. You could make the ring entirely diamond, or add coloured diamonds for the baguettes or even the centre stone. One of the most classic and sophisticated ways to use the emerald cut is a single stone on a delicate band that can be pave or plain. There is a reason that solitaire rings remain a popular choice throughout each era. This style is simple yet stylish, putting the emphasis on the centre stone without any distraction. You still have plenty of variety, too. Depending on the metal of the band and the type of stone you use, this ring has lots of options to suit every style. Split band rings are another style that will never go out of fashion. Pave stones feature frequently in this design, but you can also omit the added stones for a simpler band. What makes the split band ring so popular is how it creates soft lines that highlight the centre stone subtly. Depending on your choice of band, metal and stone, this ring can be as simple or bold as you prefer. Via RebeccaOvermann.com Three stone rings are another timeless option. 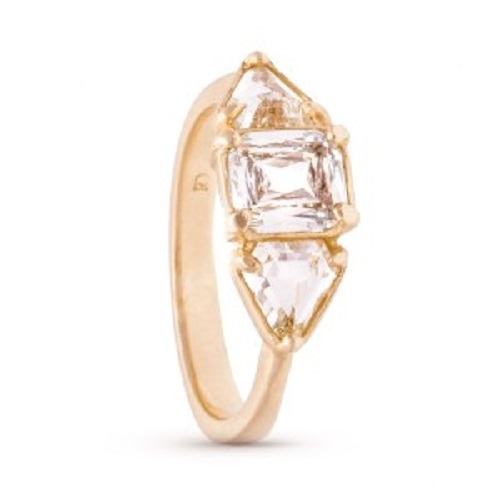 While the classic design usually features three emerald cut stones, or an emerald cut and two round or square cut stones, a more modern take on this ring features triangular stones. The result is an Art Deco slash contemporary ring that is certainly unique in its look. This style works well in any metal, with any choice of stones. This exquisite halo emerald cut ring ensures that the emerald cut stone has maximum sparkle and shine. Tiny pave stones are arranged around the centre stone, continuing along the band. While this style works well in platinum and diamond, you could also use rose gold for the band and a coloured diamond or a precious stone such as Tanzanite, morganite or sapphire. At Cape Diamonds, we offer an outstanding selection of rings to suit every style. Browse our modern engagement rings to start planning your dream ring today! Dazzling Yellow Gold Engagement Rings » « Which Engagement Ring Will Look Best on Your Finger?